August 17th 2018 – South easterly winds prevail here in Key West as we slide further into the Dog Days of Summer where the blue water bite starts to slow down here off of Key West and The reef bite is were most of us go to get our meat fix on with tasty filets from yellowtail snapper, mutton snapper and groupers. This weekend marks the last days we will have for the Red snapper three day double weekend where it was a huge success with all the trips going out to get their 1 per person bag limit of the over populated tasty snappers. Red Snapper Caught last weekend on board the Too Intense with Capt. John here at Dream Catcher Charters. So….. The reef fishing off of Key West looks like this this week. In the last few days we have a very consistent yellowtail snapper bite that we have been able to get into on a 4 hour trip and offer our anglers a great bit of food fish for their cooler. Yellowtail snapper are a tasty snapper that we just love here in the Florida Keys. Its a bit windy this week but the reef conditions are very fish-able especially in our 36 ft Yellowfin Center Console. Added to the yellowtail snapper fishing we have also had some mutton snappers as well coming up and smashing our artificial lures making a fun tasty surprise while we catch yellowtails. 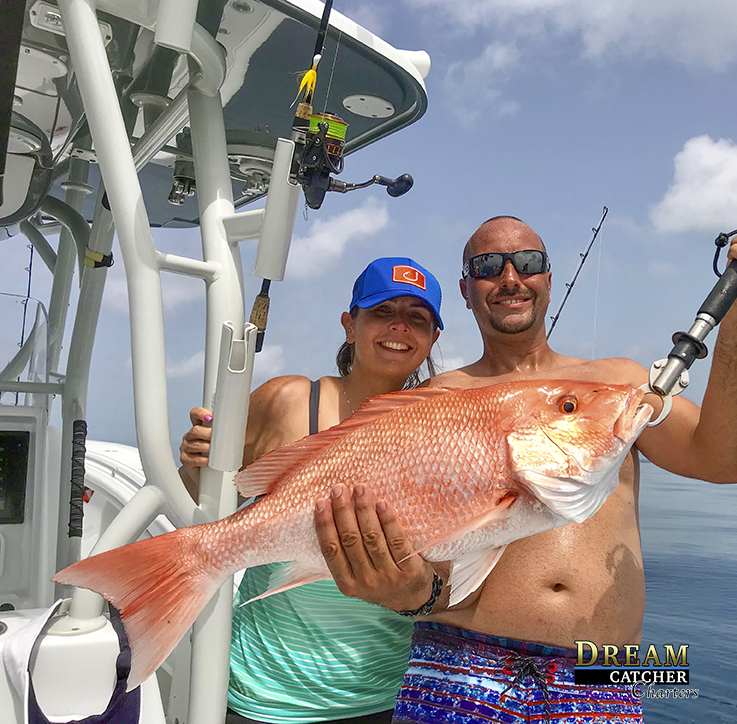 On our longer trips 6 and 8 hours we have been seeing the snapper all get a little larger as we are able to get farther from Key West and we are also having better shots at our grouper as well. The deep wrecks have been holding lots of fun. We have been fishing them lately for the American Red snapper during this open season weekend and of course getting our limit of those.. Added to that our anglers have experienced some large Lane and Mutton snappers on the deep wrecks with occasional black grouper. On the wrecks we are also hooking up on Almaco Jacks and Amber Jacks for some rod bending fun. While we are out there its inevitable we see a school of tuna mixed in with bonita for some casting and trolling fun. Check out below the exact lures we use to troll up Tuna and Wahoo while we are fishing outside the reef. where we focus on catching as many species as possible to show folks what we are capable of here Key West fishing. Groupers, snapper, barracudas, permit, jacks, mackerels and many more species of fish are caught on this trip year round. Ask about it. We are coming into the fall. Typically it can be slow for our reef and wreck fishing charters out of Key West but this year seems to be pretty steady. If you would like to go fishing with us or any of our colleagues, give us a call and we will get you on a fun day. The Rapala X Rap 30 is a great high speed trolling bait that brings the tunas and wahoos to the boat. The Seaguar is a great leader for the trolling lure. Here are the colors that we like to use here in Key West Fishing. These Trolling Lures Are Also Great for reef fishing trolling for Grouper.